Apple has released this year’s first Security Update for Mac OS X. 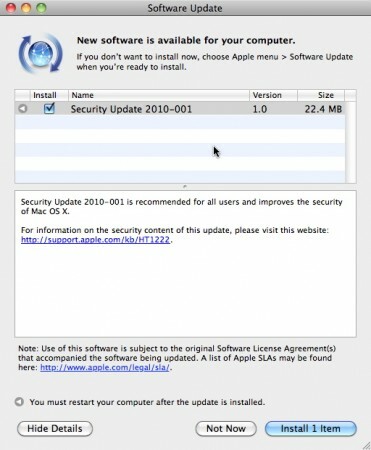 Security Update 2010-001 is recommended for Mac OS X 10.6 Snow Leopard, 10.5 Leopard and 10.5 Leopard Server. Security update addresses issues with the following: CoreAudio, CUPS, Flash, ImageIO, Image RAW and OpenSSL. More information about the security update from Apple’s site. For direct downloads: Snow Leopard. Leopard. Leopard Server. On my iMac I have repeatedly got these 2 events. A website with the following URL props up saying your computer is infected and needs to be scanned: cancel or OK.
Twice I shut down safari, once I clicked on cancel tab and once clicked on scan. After clicking on scan I shut down the web tab after 3 minutes or so.